Olivia de Havilland is one of the very last surviving major players of classic cinema. A strong personality combined with a finely tuned sense of discipline and practicality has helped to spare her the ills that so often befall Hollywood stars of that generation, and having successfully navigated the system, has lived her life in relative harmony and quiet since retiring (mostly) from the screen in the 1960’s. She made a few appearances in small movies in the 1970’s, but for the most part she chose to focus on raising her children and living a quiet life in Paris, where she has resided since 1953. I could go on and on about Olivia and my love for her, as a person and as an actress, but suffice it to say that she is one of the most gifted actresses we have ever seen on the screen, and one of the most genuinely considerate people I have ever met. I seem to talk about her in superlatives, because that is what she exudes–the best. I would say that it is a stroke of extremely good luck that she has lived for so long, but it seems to me that it’s more than luck and good genes–she is just meant to be here for a good while longer. She often speaks of feeling as though she has a purpose, what many people cite as a huge boost to longevity. In excellent health and even more excellent spirits, Olivia de Havilland is poised to live to 120. I won’t go into my story of meeting her, as I’ve already done that once here (if you haven’t read it and wish to, you can click on the entry here or read my guest entry on Joan and Olivia: Sisters of the Silver Screen), I will simply say that it was a great pleasure and an honor to be in the presence of not only one of the great screen actresses of our time, but also one of the kindest people. 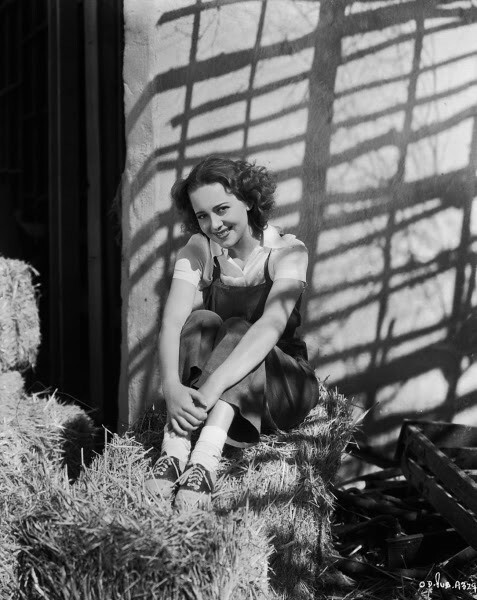 Here are some of my favorite photos and videos of Olivia de Havilland through the years. Happy 96th birthday Olivia, and may we be blessed with sharing 96 more years on this earth with you. 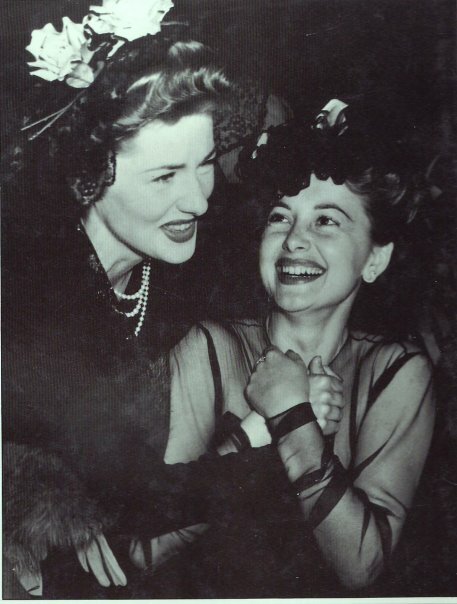 With sister Joan Fontaine after Joan won her Oscar for “Suspicion,” 1942 Oscar ceremonies. 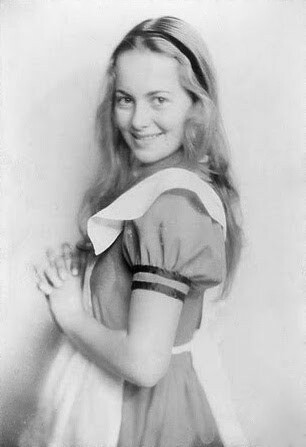 As Alice in a community production of “Alice in Wonderland,” in her hometown of Saratoga, CA, age 16. Receiving the National Medal of Arts in 2008. It is worth noting that Olivia is a lifelong committed and active Democrat, extremely critical of the war in Iraq and George Bush’s policies. However, here she puts aside personal politics and is gracious and appreciative. We can learn a lot from this attitude of hers that politics is not everything, and we can put our personal feelings aside when they are not relevant. Recognition for Olivia with a standing ovation at the 2011 César Awards. The acknowledgment of her begins at 1:18. Thank you for this lovely tribute of a truly wondrous Star of old Hollywood! when i was a small boy i used to play football,climb trees,build camps,get into scrapes but i also used to love watching films whether from the 40s,50s,60s, or 70s,i remember sneaking downstairs when my parents were asleep and watching a film called the dark mirror and to this day ive always had a soft spot for olivia de havilland,i love watching her films with errol flynn,basil rathbone and others and when elizabeth taylor died the media said she was the last of the great actresses well im afraid they are sadly mistaken,olivia de havilland and maureen o hara we still remember you both and you ARE hollywood. I LOVE Dark Mirror. I think it’s one of Olivia’s finest performances and it never gets the credit it deserves. And yes, Maureen and Olivia–and we can’t forget Olivia’s sister Joan Fontaine! I have met Maureen and Olivia and I have corresponded with Joan. Classic Hollywood win! Great collection of photos, and a wonderful tribute. She is one of the best. What a lovely tribute to a lovely and talented lady. We are so lucky to have her with us! Thanks for posting this fitting tribute. I think most of us can’t get enough of Olivia de Havilland!